Niagara Falls is special to me for an important reason. It is where Hubby and I first visited on our honeymoon soon after my arrival in Canada as a new bride seven years ago. My excitement knew no bounds when I finally got the chance to check out this wonderful place in person and we sure had a memorable time. I gambled for the very first time in the Falls View Casino (only after they ‘carded’ me because I didn’t look my age, but whatever!) and I was bouncing up and down when I won $10 from a game! I insisted on checking out the Frankenstein Castle and dragged my hubby along. He said, it won’t be a good idea but I really wanted to see how scary the place is. But true to my husband’s prediction, I screamed when skeletons and hooded figures jumped out at me from the dark corners of the castle and in the process, broke my glasses. Hubby was furious and he vowed that we will never go back there again even if I want to give a second chance to Frankenstein in future! Believe me, the thought never occurred to me ever! We went on Ferris Wheel and it was awesome! I could see the whole town and the Falls from up the top- It was beautiful. We dined at a Chinese restaurant in the Entertainment District. The food was delicious and we had such a great time at the dinner. Everything was perfect. Since our first trip, it became a tradition for us to go back to the Falls again and again every year. First couple of years, it was just the two of us, and later we continued to visit with the kids. Kevin and Krista, both share our enthusiasm and as a family, our trips to Niagara Falls was always something to look forward to. 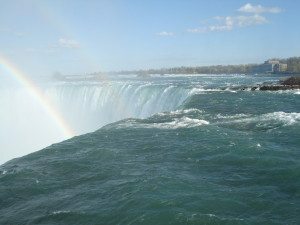 The most recent trip to Niagara Falls was even more special and I really want to share my experience with you. It was for the very first time, we got an opportunity to stay at the Falls View Suite of Embassy Suites Hotel. And it was mind blowing! The hotel’s lobby highlights a contemporary design. The facilities include heated pool, two spa tubs, an arcade, game room and a fitness center. Each Suite comes with microwave, small fridge, and two televisions-one in the sitting area and one in the bed room. There is also a sofa bed in the living room for any additional guests. 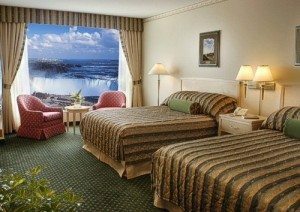 The suite itself has two spacious rooms- one bedroom that features two queen beds with the spectacular view of the falls. I was told that there were babysitting services available at the hotel but we didn’t use them. Kevin and Krista loved the Suite instantly and didn’t waste anytime in rushing to the comfy bed and turning themselves into to ‘bouncy crazies’. 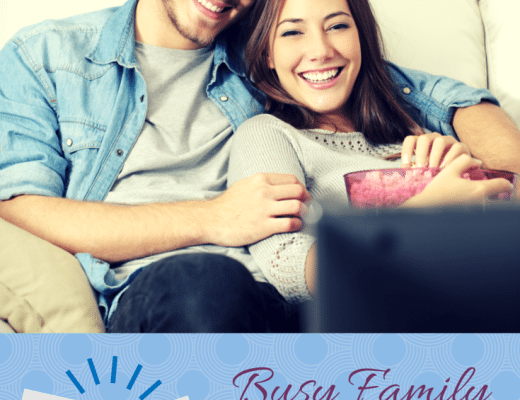 Hubby instantly launched himself in the living room with the full intention of checking out the TV and taking stock of the channels available. I moved towards the washroom to check it out and I was met with a Jacuzzi (yay) and I promised myself to put it to good use later. And I did! There was a small window that opens up to the adjoining bedroom from the washroom. I found that as cute! I figured I could use the window to keep tabs on my kids from getting wild while using the Jacuzzi- Neat idea! The toiletries and the fluffy hotel towels were all in place and the washroom looked spotless. I was even happier when I went to look out through the big window that overlooked the falls in our bedroom suite. 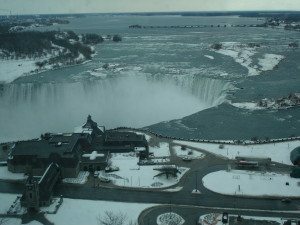 Niagara Falls looked majestic and I felt like I am closer than ever to the fall from the comfort of the Embassy Suite where I will be able to soak up the beauty of it day and night. The View of Niagara Falls from our Suite! Amazing, right? All these years of going back to Niagara and staying over at various hotel rooms couldn’t prepare me for the grandeur and hospitality that the Embassy Suite had to offer. There was Manager’s Reception in the afternoon where the guests where served tea, coffee, two complimentary alcoholic drinks and snacks. The reception area was huge with tables and chairs. Snacks and drinks were arranged neatly on the side. Hubby had tea, kids had some chips and pretzels and I had a Margarita! Oh yes, why not, right? We were the guests in one of the amazing hotels in one of the beautiful places in the world and I had every reason to have my drink! After the Manager’s reception, we set out to explore the falls and walk around the town. It was fun. We went in Ferris Wheel, visited wax museum, had ice creams and headed back to our hotel to have dinner at The Keg where they featured floor to ceiling windows offering the view of the Falls again at every table. Yet another ‘falls experience’! Afterwards, we went up to our Suite to enjoy the ‘light show’ of the Falls which we could see very clear and up close from our bedroom suite window. In the morning, we were welcomed by a complimentary buffet breakfast with a cooked-to-order omlette station. Oh, the food was yummy! There was coffee (important),tea, toasts, pancakes, waffles, sausages and bacon. They make you eggs while you wait. Isn’t that wonderful? Well, we all had a good time and needless to say, Kevin didn’t like it one bit when Mommy and Daddy announced to him that it is time to pack up and vacate our Suite. Yeah, I don’t blame him for that! Embassy Suites did a very good job in making our ‘Falls Experience’ special. 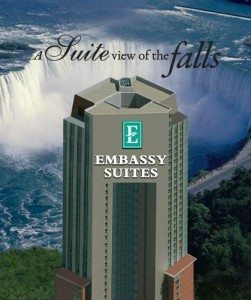 I will strongly recommend this hotel to anyone who is looking to have a quality time with their family while visiting Niagara Falls . If you include Niagara Falls in your next travel plans, make sure you book your stay at Embassy Suites! I’ve never been, but it is definitely on my list of places I want to visit. It looks like you guys had a blast! Wow! I had to do a double take! That’s real!?! How pretty! I’d love to see that one day! What a wonderful place to visit. It’s on the list of places I want to see at some point. Great review! I will have to keep this in mind if we ever get the chance to head that way! Thanks! Last year I was online looking up different hotels because the girls and I were considering going to Niagara Falls for vacation. I’ve seen this one on the web. We didn’t get a chance to go but this looks so relaxing. Looking at the falls while sitting in your room is super amazing!